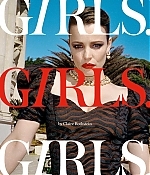 Rachel is gracing the upcoming cover of Girls Girls Girls magazine’s issue 2. You are able to preorder the magazine at Boutiquemags.com (shipping worldwide!). We have added the magazine cover and the first photoshoot outtakes in our gallery. Photographer and founder of the magazine Claire Rothstein shared the motivation/reason behind this outtake in an instagram post which you can find after the jump. The Hollywood Reporter is reporting that Scott Derrickson is set to return for the sequel of “Doctor Strange“. Rachel’s costars Benedict Cumberbatch and Benedict Wong will return as well with Rachel “likely to return as well”. Variety is also reporting the return of Derrickson with Cumerbatch, Wong and Rachel “expected to reprise” their roles. Scott Derrickson, who directed and co-wrote the mystical Marvel hero’s initial 2016 outing, has quietly finalized a deal to helm the new installment. A search for a writer to pen the script is about to get underway. Benedict Cumberbatch will return as Stephen Strange, the good doctor turned master of the mystic arts, as will Benedict Wong, who played his right-hand man, Wong. 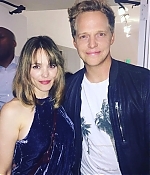 Rachel McAdams, who played Stephen Strange’s love interest, is likely to return as well. Strange was last seen de-materializing in the $2 billion-grossing Avenger: Infinity War, where one of his lines of dialogue served as the inspiration for the title of the fourth Avengers movie, Avengers: Endgame. Marvel has been tight-lipped about its plans for life after Endgame, which it is calling Phase Four. After all, how much can there be when half your heroes are supposed to be dead? In any case, sources tell The Hollywood Reporter that the plan is for the script to be hashed out in 2019 with an eye toward a spring 2020 production start. If all goes well, the movie would be casting its spell on audiences in May 2021. Rachel Receives Critics’ Choice Nomination! The nominees for the 24th Annual Critics’ Choice Awards were announced earlier today and Rachel received a nomination for her work in “Game Night“. Rachel has been nominated for Best Actress in a Comedy alongside Emily Blunt (Mary Poppins Returns), Olivia Colman (The Favourite), Elsie Fisher (Eighth Grade), Charlize Theron (Tully) and Constance Wu (Crazy Rich Asians). “Game Night” received two other nominations: Best Comedy and Rachel’s costar Jason Bateman received a nomination Best Actor in a Comedy. Congratulations to Rachel and the cast and crew! For a full list of nominees be sure to head over to the official website. Winners will be announced, broadcast live on The CW Network on Sunday, January 13, 2019 from 7:00 – 10:00 pm ET (delayed PT). Rachel is gracing another cover to promote the upcoming release of “Disobedience“, which will be released in cinemas tomorrow in the UK. 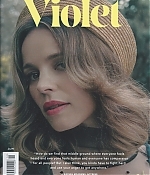 Rachel is on the cover of the current issue of Violet Book magazine which is currently on newsstands. She is interviewed by Rebecca Lenkiewicz, the screenwriter of the movie. It’s a really nice and in-depth interview which you can find our press archives. We have added the scans and photoshoot outtakes in our gallery. 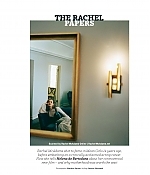 Rachel graced the cover of this past weekend’s issue of The Sunday Times’ (UK) Style Magazine to promote the upcoming release of “Disobedience” in the UK. We have added the (digital) scans in our gallery as well as the photoshoot outtakes. The interview can be found in our press archives and excerpts can be found below. “Disobedience” will be out in cinemas on November 30 in the UK. Rachel attended the 7th Annual Breakthrough Prize yesterday. The “Oscars of the Science” celebrates scientific achievements and this year they paid tribute to Stephen Hawking. 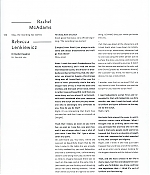 Rachel was one of the presenters and she presented alongside president of PayPal Dan Schulman. We have added the high quality images in our gallery. Many thanks to my friend Luciana for her donations. Rachel is wearing a Rami Kadi Couture gown with Hearts On Fire jewelry. The ceremony aired lived on National Geographic. Stay tuned for our (video) coverage later this week! Spaceref – The seventh annual Breakthrough Prize ceremony – known as the “Oscars of Science” – will bring together the stars of science with leading figures from the worlds of technology, business and entertainment, to celebrate scientific achievement and pay tribute to the late Stephen Hawking, on Sunday, November 4. The ceremony will air live on National Geographic at 7 PM PT / 10 PM ET. This year, the ceremony will celebrate nine scientists, recognized for achievements in life sciences, fundamental physics and mathematics. All eight of the 2019 Breakthrough Prize laureates, as well as the winner of the 2018 Special Breakthrough Prize in Fundamental Physics, will be featured at the gala ceremony. This year’s celebrity guests will include musical performers Lionel Richie and G.E.M., and presenters Orlando Bloom, Ron Howard, Rachel McAdams,Julianne Moore, Thandie Newton, and Lupita Nyong’o. The 2018 British Independent Film Awards (BIFAs) were announced earlier today and “Disobedience” received 5 nominations, including a Best Supporting Actress nomination for Rachel. The other nominations are: Best British Independent Film, Best Actress, Best Supporting Actor and Best Screenplay. Congratulations to Rachel, the cast and crew! Winners will be announced at the British Independent Film Award Ceremony on Sunday 2 December at Old Billingsgate. For the full list of nominees be sure to head over to the official website. The Black List Live hosted a live read of Elliott Owen’s script titled “Charming“. Rachel performed the role of Talia during the live read. 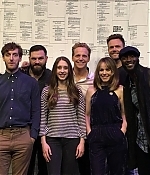 Other cast members were Joel McHale (as Charming), Thomas Middleditch (as Faithful Henry), Adam Scott (as Ferdinand), Aldis Hodge (as Monkshood/Philippe The Bold), Taissa Farmiga (as Talia) and Chris Geere (as the narrator). The script is set in Charming’s Kingdom, once upon a time. We have added the high quality images in our gallery.